A far-right anti-Islamic party emerged as the big winner in the European elections in the Netherlands yesterday as the rest of the Continent braced itself for further gains by fringe parties over the weekend. 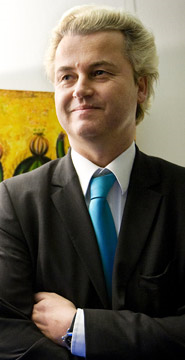 The Party for Freedom led by Geert Wilders, the maverick Dutch MP who was banned from entering Britain this year for his beliefs, won four seats in the European Parliament at the first time of asking, having been formed in 2006. The result, which placed the party second in the Netherlands, behind only the ruling Christian Democratic Alliance (CDA), suggested that anti-immigrant parties would attract disaffected voters in a number of countries in the European polls. They are expected to gain seats in Austria, Belgium, Italy, Hungary, Slovakia and Romania. At least the Times refrained from calling the Freedom party for racist nazis. Even if I do find their description unfair, misleading, unjust and downright unethical, all us far-right anti-islamists must be feeling pretty good about this one. I only hope the same sort of thing happens here in Denmark on Sunday. My sincere congratulations to Mr. Wilders, his party and to the Netherlands. This entry was posted on June 6, 2009 at 12:06 am	and is filed under Generic. You can follow any responses to this entry through the RSS 2.0 feed. You can leave a response, or trackback from your own site.